"IWM Duxford had pulled out all the stops to get as many Hurricanes present as possible..."
September signals the finale of the air show season at IWM Duxford, and this year they wrapped up their flying year in style with the warbird packed line up featuring a large number of British early war types to follow the shows theme, namely the Battle of Britain. 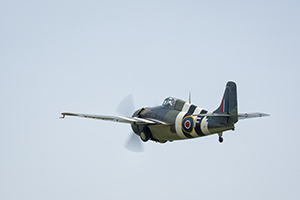 As ever it was apparent that a lot of planning had gone in the show held at the historic Duxford site with numerous activities running before and alongside the flying programme to keep everyone entertained throughout the day. The record breaking Concorde example held in the airspace hangar carried out a fascinating display of some of the design features employed by the sleek supersonic airliner including the famous nose droop along with brief talk from museum volunteers. Other crowd drawers throughout the day included talks from retired USAF Colonel Richard Graham next to the Museums Lockheed SR-71A “Blackbird”, which he actually flew during his service, the 1940’s dance troupe, the Jitterbug Jive and DX17, a major site –specific contemporary art installation commemorating 100 years of Duxford’s history and stories. 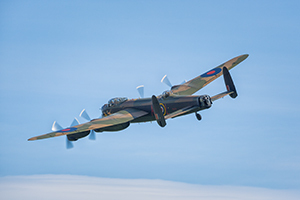 This Septembers show saw large crowds of spectators with Saturday seeing 17,000 visitors and Sunday seeing a slightly larger 19,000. The weekend saw mixed weather, with Sunday being the brightest of the two days with glorious sunshine accompanied by some strong winds which did sadly affect the flying schedule at times with certain aircraft unable to get airborne due to excessive crosswinds; notably the Fighter Collections Fury and Nimrod and the Shuttleworth Collections Lysander a bitter disappoint for the aviation aficionados out there, but unavoidable none the less. The flying programme kicked off at 1pm with the Royal Air Force’s Falcons Parachute Display Team who gave the crowds the chance to see their stacked jump formation as they neared the ground. The RAF Brize Norton based jump team gave a professional display in challenging windy conditions before standing to attention at crowd centre. 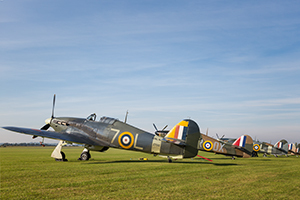 The actual flying element of the programme started in fantastic fashion with an evocative display of 6 Hawker Hurricanes, depicting the backbone of fighter command during the summer 1940. As you looked around the crowd lines during the display it was clear it formed quite an emotional display for a lot of the spectators present. A truly magnificent site, something not seen of the type in recent times. 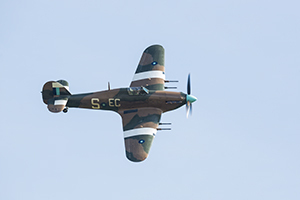 As you looked down the flight line prior to flying it was clear that the team at IWM Duxford had pulled out all the stops to get as many Hurricanes present as possible, which even included a rare visitor to a Duxford show in the form of Hangar 11’s Hurribomber, “Pegs”. 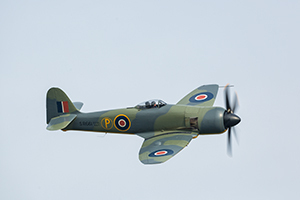 The flight directors had successfully produced a true celebration of Hawker’s classic design. 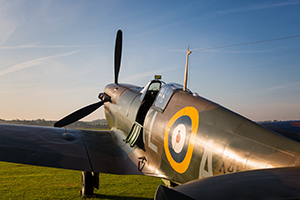 A quick rundown of the aircraft operators included aircraft supplied by the Historic Aircraft Collection, Hugh Taylor, Biggin Hill Heritage Hangar, The Shuttleworth Collection, the Hangar 11 Collection and Anglia Aircraft Restorations. 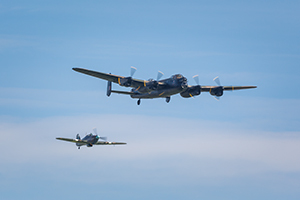 The Battle of Britain theme continued with the arrival of the RAF’s Battle of Britain Memorial Flight with their Avro Lancaster B I and Hurricane mk IIC, PZ865. 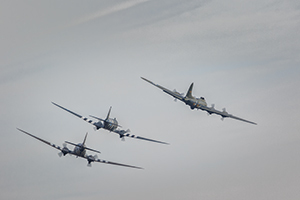 The pair gave a graceful display with some fantastic top side passes from the Hurricane. With display formations featuring heavily on the flying programme the skies quickly filled with the sound of 9 Gipsy Major Engines of the Tiger Nine Display Team. 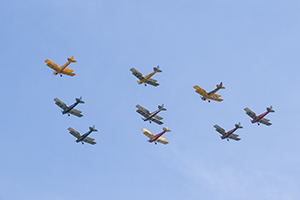 Formed in 2005, the display team put on its unique flying display for the crowds with their selection of differently coloured de Havilland Tiger Moth airframes, culminating a crowd centre break which was quite an impressive site to see from 9 vintage bi-planes. The Fighter Collection’s chrome Curtiss P-40C Warhawk put on a noteworthy display, potentially being the solo display of the day with some fantastic airfield beat ups and high climbs before diving back down to display centre, the mirror finish of the fuselage and wings shining in the afternoon sun. The first of the days re-enactment pieces took to the skies in the form of the “Russian Front” with a Luftwaffe invader strafing a Russian airfield before being quickly pursued by a pair of Russian Yak-3’s. The Russian defenders kept up with their interception and ultimately prevailed over their invading foe. 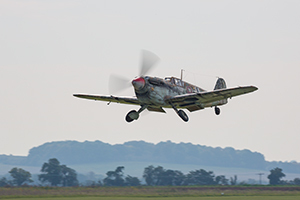 An interesting sight, with pyrotechnics to simulate the strafing run by the Aircraft Restoration Company’s Buchon, representing a Messerschmitt 109. 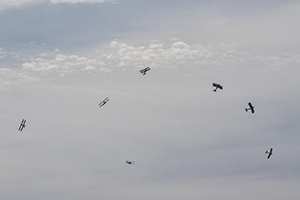 Continuing on with the re-enactment sequences, the Great War Display team, in their replica First World War Bi and Tri Planes were next on the flying programme. 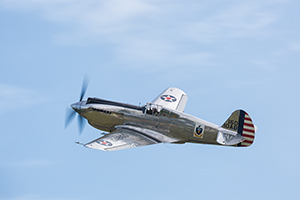 The charismatic team of aircraft leapt into the air diagonally across the airfield directly into wind before forming up and then breaking off into their tale chase sequences including further pyrotechnics and smoke. 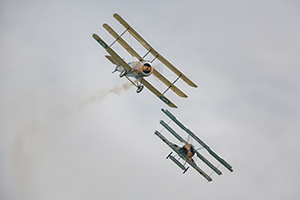 Seeing the vintage types chasing each other trying to simulate the firing angle it reminded everyone how brave those early aviators were in the very open and vulnerable cockpit positions. 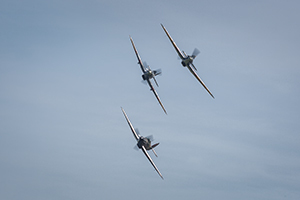 Famous for its unique themed warbird formations, the flying programme at the Battle of Britain show produced a unique Naval Fighters flypast. 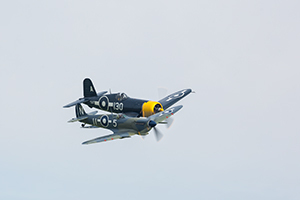 Originally planned as a three ship formation with the Bearcat, Corsair and Seafire LF III, the display quickly became a two ship as the Bearcat appeared to have an issue with retracting its landing gear and for safety came into land. 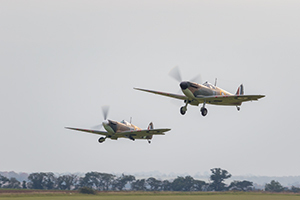 The remaining two fighters carried out a couple of tight formation passes, a rare partnering not seen at Duxford before. 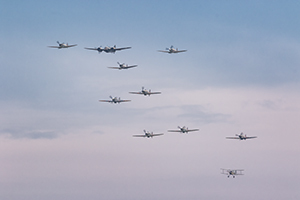 Duxford residents and regular display acts, the Fighter Collection’s FM2 Wildcat and Plane Sailings PBY-5A Catalina conducted a contrasting display representing the Battle of the Atlantic. The slow and graceful Flying Boat arced around the airfield whilst the nimble Wildcat displayed with a little more pace climbing high and diving down low; always a joy to watch. 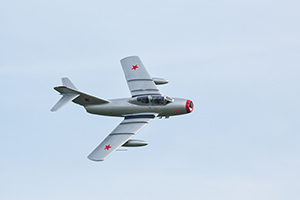 The represented timeline fast forwarded a few years to the cold war with a trio of vintage jets consisting of two de Havilland Vampires and a single Mig -15 UTI, all of the Norwegian Air Force Historical Squadron. 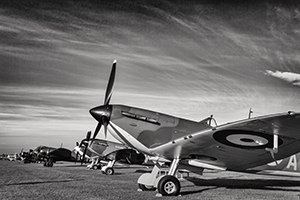 The group of early cold war jets have quickly become regular visitors to Duxford Air Shows, and the UK air show scene in general. The dual seat Mig performed a series of single low level top side passes before joining up with the two vampires. 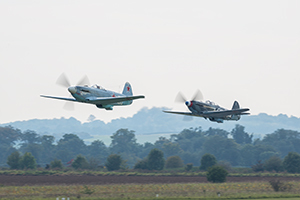 Duxford wouldn’t be Duxford without Spitfires, and the Battle of Britain Show was no exception, with 12 examples taking to the air to perform a mass fly past and tail chase sequence which went ahead in two groups. 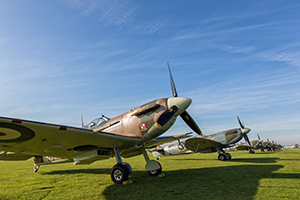 The gaggle of Supermarine’s finest wasn’t quite as big as the 17 seen at the 2015 Battle of Britain Anniversary show, but none the less a jaw dropping sight and an glorious symphony of Rolls Royce Merlins and Griffons, as well as the single Packard Merlin of a Mk XVIe. 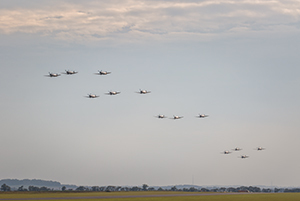 The last display of the day was the final salute to “the few”, with a fantastic formation of aircraft representing the Royal Air Force at the time of the Battle of Britain. 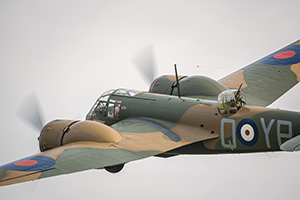 The Bristol Blenheim led five Hawker Hurricanes, one less than planned due to technical issues with the Shuttleworth Collection’s Sea Hurricane, along with three mk I Spitfires, tightly followed up by a single Gloster Gladiator. 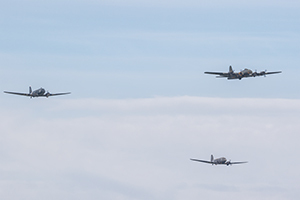 Such a gorgeous and memorable flypast dedicated to those who made the ultimate sacrifice during the summer of 1940, a line up you are unlikely to see anywhere else in the World. 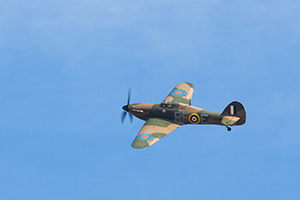 As the day came to a close, so did the air show flying season at IWM Duxford. A big well done to everyone on the various teams that help put together these fantastic shows held on the historic site. Also a big thank you to all the aircraft operators, owners and pilots, the displays they put on are always fantastic and in some cases nothing short of magical. With 2018 being the Centenary of the RAF, one can only wait with bated breath to see what the IWM have in store. 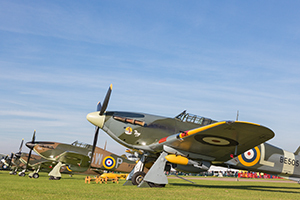 Next years show dates have already been released as 26th – 27th May (Duxford Air Festival), 14th – 15th July (Flying Legends) and 22nd – 23rd September (Battle of Britain Air Show), with early bird tickets available to buy from January 2018.